Maroone Ford of Margate in Florida is one of AutoNation's best at selling service contracts from the service drives. Shane Dyer, the Quick Lane manager, is its top-selling service adviser in the country. Shane Dyer rolled into work just after 6 a.m. on Sept. 9 thinking of the possibilities. The manager of the Quick Lane service business at Maroone Ford of Margate was expecting two regular customers who might be candidates to purchase an extended service contract. Could he make a sale and put another "X" next to his name on the white board keeping score in the service department of the south Florida AutoNation dealership? For the past year, Dyer and the service advisers at Maroone Ford have been selling extended service contracts and prepaid maintenance contracts from the dealership's service drives. It's part of AutoNation's companywide initiative to boost revenue of products normally sold in the finance and insurance office -- and to keep customers coming back to the service department. Dyer receives $75 for each service contract he sells: $25 from Ford and $50 from AutoNation. The money is good motivation, Dyer admits. But the ultracompetitive manager also likes knowing that each sale helps the company and adds to his reputation as a go-getter. "I just got AutoNation another customer for four or five years," says Dyer, 32. And that's the ultimate goal behind the push to get service advisers to sell products typically sold in the F&I office, says AutoNation COO Michael Maroone. "The whole idea is to drive repeat business into service -- to demonstrate our capabilities, to gain the customer's trust that we are the right place to service their vehicles," Maroone says. Through the first half of 2010, AutoNation sold 60,000 prepaid maintenance plans. Of those, 21,000 were sold in the service drives, Maroone says, adding, "I'm pretty happy with that." Those maintenance plans, covering oil changes and tire rotations, are the primary focus of the service-drive effort. Sales of the much more expensive extended service contracts also total about 60,000 companywide. But just a tiny fraction -- maybe 1 percent -- comes from the service drives. Some stores are doing a better job than others of selling the products. Dyer's Fort Lauderdale-area store is in the better category. Maroone Ford of Margate is one of the retailer's best at selling service contracts from the service drives. 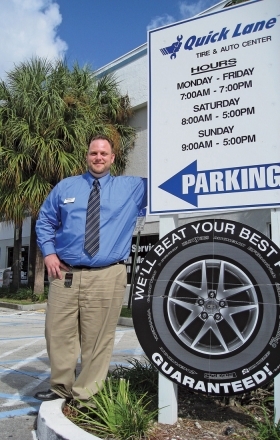 And Dyer, a six-year employee at the dealership, is AutoNation's top-selling service adviser in the country. Up to 20 percent of Maroone Ford's service contract sales come from the service department, and that share is increasing. Through early September, the department sold $290,000 in service contracts, says Rob Romero, the service director. Credit goes to Dyer for 75 contracts or about $163,000 of that revenue. The scorekeeping white board shows four service contract sales in the department so far for September. Dyer has one X by his name. A not-quite-erased X shows faintly. "I don't want to talk about that," Dyer says. He pauses, then opens up a few minutes later. The lost sale is a customer who wanted to buy a plan but couldn't get credit card approval. Dyer plans to check back with her. Despite the lost -- for now -- opportunity, he's still optimistic. Dyer is on track to pass last year's achievement: 105 service contracts sold between August, when the store's push began, and the end of the year. "I should probably hit my 80 mark, hopefully by this week," says Dyer, a self-described country boy from Tennessee with a burly physique to match. He moved to Florida as a youth but still declares Knoxville, Tenn., his hometown on his company name badge. Dyer notes that business in general has sagged in the past two months with concerns about the economy and the start of school. But lots of potential remains to be tapped, says Benny Dominguez, who oversees 13 AutoNation stores in south Florida. Sixty percent of car buyers leave the F&I office without a service contract. Through August, Dominguez's stores have collected an extra $1 million in revenue from about 52 service contract sales monthly. "That's almost found money for us," he says. At 7 a.m., the Quick Lane doors open, and Dyer and his staff set about their task of trying to find more. At 7:05 a.m., the first customer of the day walks in, and service adviser Jim Stavrojohn soon gets the day's first X on the white board. A retired woman with a 2010 Ford Edge crossover and grandchildren in Alabama paid almost $2,600 out of pocket for a service plan. A regular Maroone Ford customer in her mid-70s, she emphasized that the Edge would be her last car. She wanted a sense of security that she'd be able to get her vehicle fixed without hassle, even with regular drives to Alabama. Dyer and his advisers don't follow a script. They work to establish a rapport with customers, finding out why the person is there. During a walk-around of the vehicle, "I ask probing questions," Dyer says. Do you do a lot of driving? How long are you planning to keep the car? Do you have children? A lot of Dyer's sales are to single women with children. Families expecting children and parents sending their kids off to college with an aging car are also likely purchasers. Developing a relationship is key. Dyer says he sold 105 contracts in 2009 because he already had the trust of longtime customers. One of those is John Pressey of Fort Lauderdale. The recently retired longshoreman bought a service plan for his dark red 2005 Ford F-150 from Dyer last October. Nearly a year later, after a road trip to South Carolina, Pressey drops in for brake service -- one of his regular maintenance visits to the Quick Lane. He hasn't needed to use the plan yet, but he remains a believer. "It's worth it in the long run," Pressey says. "Peace of mind." Maroone Ford opened its Quick Lane two years ago with Dyer handling customers from a one-man booth. When a full department was approved, he painted and designed the office and arranged promotional material on the walls. Behind Dyer's desk, awards from Ford and AutoNation mix in with Peterbilt paraphernalia. He drives an F-150 pickup now but dreams of an 18-wheeler as his daily driver. "That's the cowboy Cadillac right there," Dyer says, pointing to his screen-saver image of a Peterbilt. He intends to own one someday when he retires. He'll custom-fit it with a bathroom, use the call sign "Southern Thunder" and use the truck for retirement travel instead of an RV. For now, Dyer makes do with a collection of die-cast miniature 18-wheelers. He owns more than 2,000 models -- a recent acquisition from Australia cost $3,500 -- but keeps just 500 on display in his house. His hobby is well-known around the dealership and even down the street. A nearby restaurant put a four-decker burger loaded with egg and cheese on its menu and named it "The Peterbilt" after Dyer. Dyer has Ford service contracts for both his F-150 and his wife's vehicle. He makes sure to tell customers that when he's pitching the product. "They see the value when you believe in what you're selling to them," he says. Dyer pitches about 80 percent of customers who come in. About 80 percent of those who buy do so on the spot. The remaining 20 percent think it over and buy on a later visit. Dyer calls it planting the seed. It's especially effective when a customer's warranty expiration date is approaching. Extended service contracts generally sell better in Quick Lane than in the traditional service department, says Romero, the service director. Customers coming in for oil changes or tire rotations already are in the frame of mind to maintain a vehicle, he says. In the traditional service department, advisers are often handling customers who are dealing with unexpected repairs already costing them $1,000 or more. Persuading them to tack on an additional $2,500 or so for a service contract is a tall order. With 3,300 job tickets written up so far this year, "we have a lot more opportunity on this side," Dyer says. Customers often come in with new cars to get their first oil change. Dyer sells service contracts most often to this group -- people who, for whatever reason, skipped buying the plan in the F&I office. The typical Ford service contract sold costs the customer about $2,800 and takes the vehicle's coverage to 7 years/100,000 miles, Dyer says. Pricing in Florida is state-regulated -- it's the same whether it's purchased in a service drive or in an F&I office. While service advisers can't discount the price, they are allowed to throw in a free oil change or maintenance visit or to waive the $100 fee for mandatory inspection on vehicles already out of warranty. A lot of customers couldn't or wouldn't swallow the price without a handy payment plan. Ford asks for 10 percent down with the balance paid over the next 17 months at zero interest. The service adviser handles the transaction from beginning to end. AutoNation stores typically sell the manufacturer-branded service plans. Training advisers on sales falls to the factory trainers and the dealership group's corporate trainers. • Service advisers at AutoNation dealerships sold 21,000 prepaid maintenance plans in the first half of the year -- more than a third of such plans sold at AutoNation. • Service advisers sold a much smaller portion of extended service contracts -- roughly 1% of about 60,000 contracts sold in the first half. • Incentives on service contracts in Florida range from $10 to $100 for each contract an adviser sells. It's now late morning, and Dyer has seen a steady trickle of customers wanting oil changes. His expected drop-ins haven't shown up. Dyer later learns they'll delay their visits for another week or so. A man in a navy blue Dodge Ram pickup pulls up and signs in. Dyer grabs his clipboard and goes outside for a walk-around. He returns to the office, mildly frustrated at a lost opportunity. The Ford dealership would be happy to sell an extended warranty to the Dodge owner, but the computer system doesn't allow Dyer to pull up the in-service date and other necessary information to process a service contract sale. "I wish that was something they could come up with," he says quietly. He and the other advisers finish the day with about 10 pitches but just the one early morning sale. A couple of customers say they'll think about it. Dyer plans to check with them in a few weeks, but he's disappointed not to have put any more X's up on the board. Despite the slow spell, he is not giving up on his sales goal for the year. He says: "I'm pretty sure they'll be back."